Pteropods were identified from epipelagic net and trawl samples in the Sub-Antarctic Zone during the 2007 mid-summer (January 17–February 20) Sub-Antarctic Zone Sensitivity to Environmental Change (SAZ-Sense) voyage, as well as in a moored sediment trap in the same region. Overall pteropod densities during SAZ-Sense were lower than those reported for higher-latitude Southern Ocean waters. The four major contributors to the Sub-Antarctic Zone pteropod community during the SAZ-Sense voyage, Clio pyramidata forma antarctica, Clio recurva, Limacina helicina antarctica and Limacina retroversa australis, accounted for 93% of all pteropods observed. 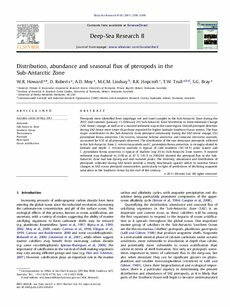 The distribution of the two dominant pteropods collected in the Sub-Antarctic Zone, L. retroversa australis and C. pyramidata forma antarctica, is strongly related to latitude and depth. L. retroversa australis is typical of cold southern (50–54°S) polar waters and C. pyramidata forma antarctica is typical of shallow (top 20 m) Sub-Antarctic Zone waters. A moored sediment trap deployed to 2100 m at 47°S, 141°E in 2003/04 showed the pteropod flux in the Sub-Antarctic Zone had late-Spring and mid-summer peaks. The diversity, abundance and distribution of pteropods collected during SAZ-Sense provide a timely benchmark against which to monitor future changes in SAZ ocean pteropod communities, particularly in light of predictions of declining aragonite saturation in the Southern Ocean by the end of the century.